I love BBQ meat on my fried rice. 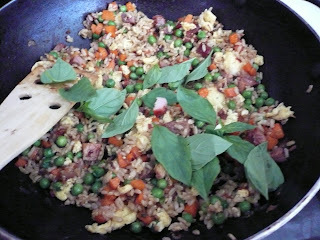 I sure will give a try adding basil to my fried rice next time. 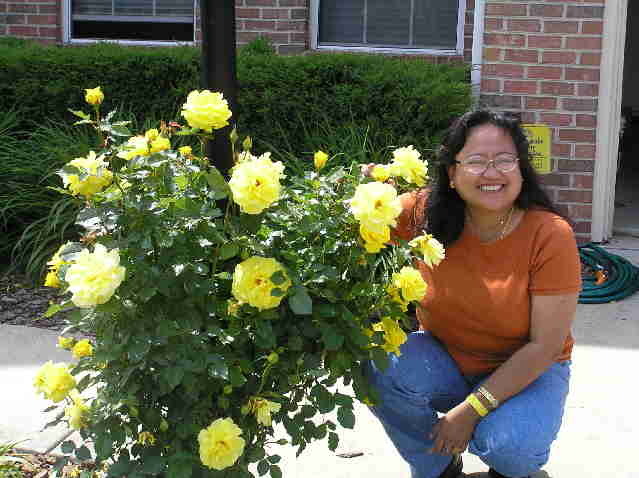 Hi!, thank`s for dropping by my blog. 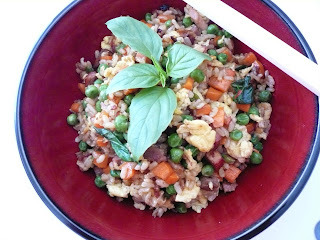 Hmm..your fried rice looks nice and delicious. 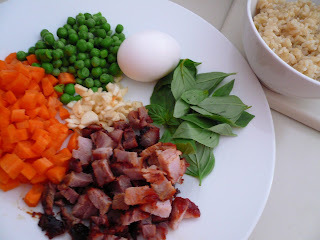 Is it with Thai Basil?. Here, I can find some kinds of Basil in Asia´s store, which one do you use?. I love hairy basil, especially cooked with steamed fish. Cat, do try it with basil and I am sure you will like it. Retno, thanks for dropping by. Yes, is Thai sweet basil and is the the kind that sold at Asian store. I plant the basil. Wan, my Thai Basil at home also same as yours. Grown really well and sometimes got to throw it away. Try ' 3 cups chicken' with Thai Basil. Taste good too. My mom used Thai Basil in egg omelette. But I don't really like it. Sue, I heard that 3 cups chicken is good. I am going to try it out. Thanks for the suggestion. The khek called basil leaves as "kim putt fon". My mother pound it together with garlic, chilli padi. Season to taste with salt and vinegar. Usually serve as a sauce with steamed chicken. Btw your rice looks yummy. knock-knock! Gert, haven't been here for a while and delighted to see so much to slurrrp on! Did you make the BBQ meat yourself? 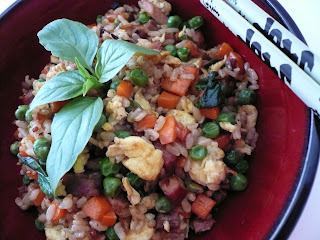 David just looked over my shoulder, "Is that fried rice? Looks delicious. What makes it different from yours?" He ain't getting any next week. LOL! Nonya, not sure what Thai Basil is call in Chinese. I never knew about it until I came here. Gert, what is 3 cups chicken? Sounds delicious. Gert, 3 cups chicken sound delicious.